According to a survey done by Gallup.com, 48% of their respondents admitted that they are not prepared for unplanned expenses – at least the major ones. These include replacing appliances or furniture, fixing a car or paying for a significant home repair. It was observed that those earning lower incomes are more likely to say that they cannot afford to pay for these emergency expenses. However, there is a surprising number of respondents (16%) earning $240,000 annually who said that they also cannot pay for unexpected expenses. This goes to show that it is not the income level does not immediately make you able to pay for emergency costs. Although almost half of the respondents said they are unable to pay for unexpected expenses, that does not mean they are in a financial crisis. 7 out of 10 said that they are able to meet their daily expenses. But if it is not within their budget, that is where they start to have problems. That means their income and expenses are almost the same. There is no room for their savings. If there is no room for savings, that means there is no way that you can save up for a reserve fund. If that is something that you are unable to do, one unexpected expense could land you in a difficult financial situation. The thing is, there are times when people have reserve funds but it is not enough to finance everything that they need to pay for. This is when you need to come up with a different plan to help get out of a tough and unexpected situation. The stress associated with an emergency situation is tiring by itself. If you add to that the problem of your lack of funds, things can escalate quickly. The situation might make you desperate and lead you to make the wrong decisions about your life. To avoid that, you need to have a backup plan in case your reserve fund ends up coming up short. 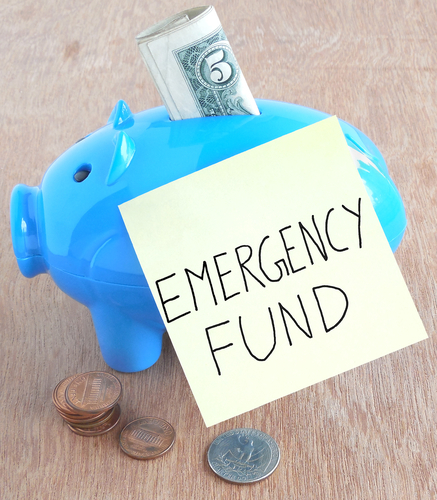 Here are a couple of options that can give your emergency fund a boost. This is a type of debt that you borrow once and you can keep on using repeatedly. It works like a personal loan and a credit card in one. You get to enjoy a lower interest but you can use the credit like a card. If you borrow $5,000, that is considered your limit. The only time that you will pay is back is when you use it. So if one emergency only cost you $1,000, that is that amount that you will pay back. Every time you need money, you can withdraw from this line of credit and pay interest only on what you used up at that time. You do not have to keep on applying for a loan every time to need it. This type of credit in increasing in popularity nowadays. According to a study done by RealtyTrac.com, there is an increase in the use of Home Equity Lines of Credit (HELOC) – with 797,865 borrowed between July 2013 to June 2014. This increased to 20,6% compared to the previous year. If you need a boost in your reserve fund, this type of credit is worth checking out. Another way to get more money for an emergency expense is to sell some of your possessions. It is probably time for you to declutter your life anyway. Taking the time to look at your possessions so you can evaluate what can stay or should be sold may be therapeutic for you. It will allow you to take your mind off your worries and put some order into your life. The items that you think can be sold may be able to help you get the extra income that you need for your emergency situation. Ask a relative for help. When the line of credit and the extra income is not enough, you can turn to your loved ones for help. After all, when an emergency strikes, it is our family that can usually help us until we are able to stand on our own two feet. Ask them for a loan or aid – whatever they can afford to give you. Show them that you tried your best by spending your reserve fund, borrowing money and selling some of your possessions. Let them know that your efforts still came up short and ask for help. Sometimes, all you have to do is ask and help will come soon enough. These three sources can help you get over an emergency situation but make sure that you are careful and smart about how you will use them all. This is especially true for the line of credit that you will borrow. Make sure that you will only use it as intended. And once you get past your emergency situation, work on rebuilding your reserve fund. You will never know when another catastrophe will strike. It is best to be prepared before that happens. Of course, building your emergency fund is easier said than done. This can be more difficult if you have a low income. To be able to grow your reserve fund, you need to spend lower than your income. That way, the extra money can be used to build up your savings. According to the December Financial Security Index of Bankrate, 29% of their respondents are not comfortable with the savings that they have for the past 12 months. These are probably the people who are not able to pay for unexpected expenses in case they happen. It can be a dangerous financial position and you need to do something if you are one of those who are uncomfortable with the money that you have in your savings account. Although it can be challenging, it is not impossible. If you know what is at stake, you will work hard to grow your emergency fund. Here are some tips that you can use to help you along. Create a frugal budget. This is one of the best ways that you can lower your expenses so you can free up money to go to your reserve fund. This simply means you have to spend only on your priority expenses and nothing more. This will help you avoid unnecessary expenses so you can maximize your emergency savings. Set a goal. Another thing that you need to do is to set a goal. Computing your emergency fund target is not that easy because you have a lot of factors to consider. But it is still important for you to state an amount that you will save up for and put it in a visible place. This will help you remember what you need to save up for and it can even motivate you to stick to your plans of building a reserve fund. Get a support system. This can be a friend or the whole family. You want to tell someone of your plans to build up your savings to add pressure. It will motivate you to save up even if it is just to save yourself from the embarrassment of failing. Put aside every spare change. Put a jar or coin bank in a visible area and put your spare change at the end of the day. It may seem like a small amount but it will add up soon enough. This can be added to your reserve fund. If you are having trouble building up your emergency fund, here are some tips from a video created by the Credit Cards website.